Chinese sovereignty and peerage, the nobility of China, was an important feature of the traditional social and political organization of Imperial China. While the concepts of hereditary sovereign and peerage titles and noble families were featured as early as the semi-mythical, early historical period, a settled system of nobility was established from the Zhou dynasty. In the subsequent millennia, this system was largely maintained in form, with some changes and additions, although the content constantly evolved. The last, well-developed system of noble titles was established under the Qing dynasty. 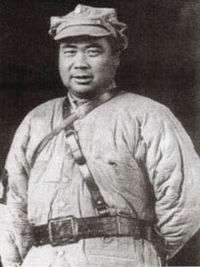 The AD-1911 republican Xinhai Revolution saw the dissolution of the official imperial system although the new Republic of China government maintained noble titles like the Duke Yansheng. Though some noble families maintained their titles and dignity for a time, new political and economic circumstances forced their decline. Today, the nobility as a class is almost entirely dissipated in China, and only a very few maintain any pretense or claim to noble titles, which are almost universally unrecognized. Elevation and degradation of rank might occur posthumously, and posthumous elevation was sometimes a consideration; Guan Yu, was styled, during his lifetime, Marquis of Han Zhou (漢壽亭侯) in the Han dynasty then posthumously in the later Song dynasty elevated to Duke Zhonghui (忠惠公) then in the Yuan dynasty Prince of Xianling Yiyong Wu'an Yingji (顯靈義勇武安英濟王) then in the Ming dynasty both beatified and royalized as Saintly Emperor Guan the Great God Who Subdues Demons of the Three Worlds and Whose Awe Spreads Far and Moves Heaven (三界伏魔大神威遠震天尊關聖帝君) and in popular culture deified as a God of Prosperity, Commerce, War, and Police. It was generally not accepted for a female to succeed to the throne as a sovereign regnant in her own right, rather than playing the role of a sovereign's consort or regent for a sovereign who was still a minor in age, so that in history of China there has only been one reigning empress, the Empress Wu, whose reign punctuated the Tang dynasty. 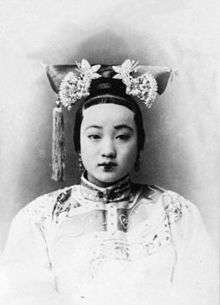 However, there have been numerous cases in Chinese history where a woman was the actual power behind the imperial throne (see éminence grise). Hou, Empress, actually Empress Consort in English terms, was a title granted to an official primary spouse of the polygamous male Chinese Emperor, and for the mother of the Emperor, typically elevated to this rank of Empress Dowager, bearing a senior title such as Tai Hou, Grand Empress, regardless of which spousal ranking she bore prior to the emperor's accession. In practice, many Chinese Empress Dowagers, either as official regent for a sovereign who was still a minor in age or from the influence of position within family social ranks, wielded great power or is historically considered to have been the effective wielder of supreme power in China, as in the case of Empress Dowager Cixi, Regent of China considered de facto sovereign of China for 47 years during AD 1861-1908. It was a custom in China for the new dynasty to ennoble and enfeoff a member of the dynasty which they overthrew with a title of nobility and a fief of land so that they could offer sacrifices to their ancestors, in addition to members of other preceding dynasties. This practice was referred to as 二王三恪. Prior to the Qin dynasty, Wang (sovereign) was the title for the ruler of whole China. Under him were the vassals or Zhuhou (諸侯), who held territories granted by a succession of Zhou dynasty kings. They had the duty to support the Zhou king during an emergency and were ranked according to the Five Orders of Nobility. In the Spring and Autumn period, the Zhou kings had lost most of their powers, and the most powerful vassals became the de facto ruler of China. Finally, in the Warring States period, most vassals declared themselves Wang or kings, and regarded themselves as equal to the Zhou king. After Zheng, king of the state of Qin, later known as Qin Shi Huang, defeated all the other vassals and unified China, he adopted the new title of Huangdi (emperor). 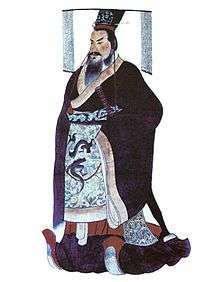 Qin Shi Huang eliminated noble titles, as he sponsored legalism which believed in merit, not birth. He forced all nobles to the capital, seized their lands and turned them into administrative districts with the officials ruling them selected on merit. After the demise of Qin Er Shi, the last Qin ruler to use the title Huangdi (his successor Ziying used the title King of Qin rather than Emperor), Xiang Yu styled himself Hegemon King of Western Chu (Xichu Bàwáng 西楚霸王) rather than Emperor. Xiang Yu gave King Huai II of Chu the title of Emperor of Chu (楚義帝) or The Righteous Emperor of Southern Chu (南楚義帝) and awarded the rest of his allies, including Liu Bang, titles and a place to administer. Xiang Yu gave Liu Bang the Principality of Han, and he would soon replace him as the ruler of China. Power was held in a large degree by Han Chinese noble families of the Central Plains based Northern Qi and Eastern Wei in the northeastern area. During the Tang dynasty the Li family of Zhaojun 赵郡李氏, the Cui clan of Boling, the Cui clan of Qinghe, the Lu clan of Fanyang, the Zheng family of Xingyang w:zh:荥阳郑氏, the Wang family of Taiyuan 太原王氏, and the Li family of Longxi 隴西李氏 were the seven noble families 七姓十家 between whom marriage was banned by law. Moriya Mitsuo wrote a history of the Later Han-Tang period of the Taiyuan Wang. 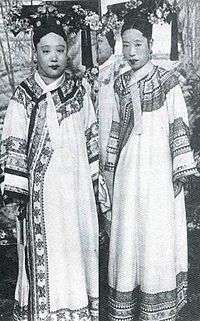 Among the strongest families was the Taiyuan Wang. The prohibition on marriage between the clans issued in 659 by the Gaozong Emperor was flouted by the seven families since a woman of the Boling Cui married a member of the Taiyuan Wang, giving birth to the poet Wang Wei. He was the son of Wang Chulian who in turn was the son of Wang Zhou. The marriages between the families were performed clandestinely after the prohibition was implemented on the seven families by Gaozong. The Zhou dynasty King Ling's son Prince Jin is assumed by most to be the ancestor of the Taiyuan Wang. The Longmen Wang were a cadet line of the Zhou dynasty descended Taiyuan Wang, and Wang Yan and his grandson Wang Tong hailed from his cadet line. Both Buddhist monks and scholars hailed from the Wang family of Taiyuan such as the monk Tanqian. The Wang family of Taiyuan included Wang Huan. Their status as "Seven Great surnames" became known during Gaozong's rule. The Taiyuan Wang family produced Wang Jun who served under Emperor Huai of Jin. A Fuzhou based section of the Taiyuan Wang produced the Buddhist monk Baizhang. The bigger Longxi Li lineage outside of the Tang Imperial family has prominent members like Li Jiongxiu, Li Yiyan, Li Kui (chancellor), Li Wei (Tang dynasty), Li Fengji, Li Zhongyan, Li Jing (general), Li Zhaode, and Li Bai. In 1452 Wujing Boshi was bestowed upon the offspring of Mengzi-Meng Xiwen 孟希文 56th generation and Yan Hui-Yan Xihui 顔希惠 59th generation, the same was bestowed on the offspring of Zhou Dunyi-Zhou Mian 週冕 12th generation, the two Cheng brothers (Cheng Hao and Cheng Yi-Chen Keren 程克仁 17th generation), Zhu Xi-Zhu Ting 朱梴 (Zhu Chan?) 9th generation, in 1456-1457, in 1539 the same was awarded to Zeng Can's offspring-Zeng Zhicui 曾質粹 60th generation, in 1622 the offspring of Zhang Zai received the title and in 1630 the offspring of Shao Yong. Zhang Zai's offspring received the appointment as wujing boshi along with Zhu Xi's, Cheng Hao's, Cheng Yi's, and Zhou Dunyi's offspring. Biographies of those who were awarded the title of Wujing Boshi in the Ming dynasty are found in Volume 284, Biographies 172 of the History of Ming (明史). Zhang Daoling's offspring, the The Celestial Masters held the title of 正一嗣教眞人. After the fall of the Qing dynasty and its "Last Emperor" Puyi in the Xinhai Revolution of 1911, Chinese President Yuan Shikai attempted to resurrect the imperial system, proclaiming himself emperor in his brief Empire of China (1915-1916) which ended with his death 83 days after its inauguration. During this period, Yuan Shikai as sovereign declared the ennoblement of several people, in this case not so much his family and clan as allies and those he sought as supporters for the new Empire. Some declined the honors. On the other hand, victorious generals were often granted official praise-names or names implying particular old and new duties or some combination of these, which would be quasi-executive or fully executive titles honored as much like peerage as like actual military rank, as in the case of Liu Bei promoting Guan Yu to a rank phrased as General Who Exterminates Rebels (蕩寇將軍) during the active course of Guan Yu's military career. ↑ "Guan Yu - The Saint of Force". China culture. Retrieved June 20, 2016. ↑ Sarah Allan (1991). Shape of the Turtle, The: Myth, Art, and Cosmos in Early China. SUNY Press. p. 59. ISBN 978-0-7914-9449-3. ↑ Shou Chen; Songzhi Pei; Robert Joe Cutter; William Gordon Crowell (1999). Empresses and Consorts: Selections from Chen Shou's Records of the Three States With Pei Songzhi's Commentary. University of Hawaii Press. ISBN 978-0-8248-1945-3. ↑ Rubie Sharon Watson (1991). Marriage and Inequality in Chinese Society. University of California Press. p. 80. ISBN 978-0-520-07124-7. ↑ Wendy Swartz; Robert Campany; Yang Lu; Jessey Choo (21 May 2013). Early Medieval China: A Sourcebook. Columbia University Press. p. 157. ISBN 978-0-231-15987-6. ↑ Papers on Far Eastern History. Australian National University, Department of Far Eastern History. 1983. p. 86. ↑ China: Dawn of a Golden Age, 200-750 AD. Metropolitan Museum of Art. 2004. p. 30. ISBN 978-1-58839-126-1. ↑ Ancient and Early Medieval Chinese Literature (vol.3 & 4): A Reference Guide, Part Three & Four. BRILL. 22 September 2014. p. 1566. ISBN 978-90-04-27185-2. ↑ China: Dawn of a Golden Age, 200-750 AD. Metropolitan Museum of Art. 2004. p. 18. ISBN 978-1-58839-126-1. ↑ Ouyang, Xiu (5 April 2004). Historical Records of the Five Dynasties. Richard L. Davis, translator. Columbia University Press. p. 76. ISBN 978-0-231-50228-3. ↑ pp. 233-234. Herbert Franke, Denis Twitchett. Alien Regimes and Border States, 907–1368 (Cambridge History of China, vol. 6). Cambridge University Press, 1994. ISBN 0-521-24331-9. ↑ ChinaKnowledge.de encyclopedia, "Archived copy". Archived from the original on 2013-05-31. Retrieved 2012-12-07. ↑ Hugh R. Clark (2007). Portrait of a Community: Society, Culture, and the Structures of Kinship in the Mulan River Valley (Fujian) from the Late Tang Through the Song. Chinese University Press. pp. 81–82. ISBN 978-962-996-227-2. ↑ Hugh R. Clark (2007), pp. 84–85. ↑ Jacques Gernet (31 May 1996). A History of Chinese Civilization. Cambridge University Press. pp. 182–. ISBN 978-0-521-49781-7. ↑ Andrew Eisenberg (2008). Kingship in Early Medieval China. BRILL. p. 94. ISBN 978-90-474-3230-2. ↑ Andrew Eisenberg (2008), p. 95. ↑ Andrew Eisenberg (2008), p. 97. ↑ Victor Cunrui Xiong (4 December 2008). Historical Dictionary of Medieval China. Scarecrow Press. pp. 171–. ISBN 978-0-8108-6258-6. ↑ Lily Xiao Hong Lee; A.D. Stefanowska; Sue Wiles (26 March 2015). Biographical Dictionary of Chinese Women: Antiquity Through Sui, 1600 B.C.E. - 618 C.E. Routledge. pp. 314–. ISBN 978-1-317-47591-0. ↑ Papers on Far Eastern History. Department of Far Eastern History, Australian National University. 1987. p. 144. ↑ Tackett, Nicolas Olivier (2006). The transformation of Medieval Chinese Elites (850-1000 C.E.) (PDF) (PhD). Columbia University. p. 81. ↑ John Lagerwey; Pengzhi Lü (30 October 2009). Early Chinese Religion: The Period of Division (220-589 Ad). BRILL. pp. 257–. ISBN 90-04-17585-7. ↑ John Lagerwey; Pengzhi Lü (23 November 2009). Early Chinese Religion, Part Two: The Period of Division (220-589 AD) (2 vols). BRILL. pp. 257–. ISBN 978-90-474-2929-6. ↑ Kenneth Pletcher (15 August 2010). The History of China. The Rosen Publishing Group. pp. 95–. ISBN 978-1-61530-109-6. ↑ Charles Holcombe (2011). A History of East Asia: From the Origins of Civilization to the Twenty-First Century. Cambridge University Press. pp. 94–. ISBN 978-0-521-51595-5. ↑ Richard von Glahn (10 March 2016). An Economic History of China: From Antiquity to the Nineteenth Century. Cambridge University Press. pp. 181–. ISBN 978-1-107-03056-5. ↑ Richard von Glahn (7 March 2016). The Economic History of China: From Antiquity to the Nineteenth Century. Cambridge University Press. pp. –. ISBN 978-1-316-53885-2. ↑ Greg Woolf (2007). Ancient civilizations: the illustrated guide to belief, mythology, and art. Barnes & Noble. p. 219. ISBN 978-1-4351-0121-0. ↑ James M. Hargett (2006). Stairway to Heaven: A Journey to the Summit of Mount Emei. SUNY Press. pp. 54–. ISBN 978-0-7914-6682-7. ↑ Charles Holcombe (2011). A History of East Asia: From the Origins of Civilization to the Twenty-First Century. Cambridge University Press. pp. 93–. ISBN 978-0-521-51595-5. ↑ Jonathan Karam Skaff (6 August 2012). Sui-Tang China and Its Turko-Mongol Neighbors: Culture, Power, and Connections, 580-800. Oxford University Press. pp. 125–. ISBN 978-0-19-999627-8. 1 2 Jeroen Duindam; Tülay Artan; Metin Kunt (11 August 2011). Royal Courts in Dynastic States and Empires: A Global Perspective. BRILL. pp. 177–. ISBN 90-04-20622-1. ↑ C. P. Fitzgerald (1933). Son of Heaven. Cambridge University Press. pp. 174–. ISBN 978-1-107-49508-1. ↑ Patricia Eichenbaum Karetzky (1 December 1995). Court Art of the Tang. University Press of America. pp. 13–. ISBN 978-0-7618-0201-3. ↑ Patricia Buckley Ebrey (25 January 2010). The Cambridge Illustrated History of China. Cambridge University Press. pp. 111–. ISBN 978-0-521-12433-1. ↑ John A.G. Roberts (13 July 2011). A History of China. Palgrave Macmillan. pp. 77–. ISBN 978-0-230-34536-2. ↑ Nicola Di Cosmo (2009). Military Culture in Imperial China. Harvard University Press. pp. 168–. ISBN 978-0-674-03109-8. ↑ Harold Miles Tanner (12 March 2010). China: From the Great Qing Empire through the People's Republic of China 1644-2009. Hackett Publishing. pp. 22–. ISBN 978-1-60384-425-3. ↑ Harold Miles Tanner (12 March 2010). China: A History: Volume 1: From Neolithic cultures through the Great Qing Empire 10,000 BCE–1799 CE. Hackett Publishing Company. pp. 196–. ISBN 978-1-60384-564-9. ↑ Harold Miles Tanner (13 March 2009). China: A History. Hackett Publishing. pp. 196–. ISBN 0-87220-915-6. ↑ Victor Lieberman (30 October 2009). Strange Parallels: Volume 2, Mainland Mirrors: Europe, Japan, China, South Asia, and the Islands: Southeast Asia in Global Context, C.800-1830. Cambridge University Press. pp. 520–. ISBN 978-0-521-82352-4. ↑ Jonathan Karam Skaff (6 August 2012). Sui-Tang China and Its Turko-Mongol Neighbors: Culture, Power, and Connections, 580-800. Oxford University Press. pp. 10–11. ISBN 978-0-19-999627-8. ↑ Jonathan Karam Skaff (6 August 2012). Sui-Tang China and Its Turko-Mongol Neighbors: Culture, Power, and Connections, 580-800. Oxford University Press. pp. –. ISBN 978-0-19-999627-8. ↑ Mark Edward Lewis (2 April 2012). China's Cosmopolitan Empire. Harvard University Press. p. 148. ISBN 978-0-674-05419-6. ↑ David A. Graff; Robin Higham (22 March 2012). A Military History of China. University Press of Kentucky. pp. 32–. ISBN 0-8131-4067-6. ↑ Paul Friedlander; Peter Miller (January 2006). Kinderculture: The Corporate Construction Of Childhood, Second Edition. Westview Press. pp. 32–. ISBN 978-0-8133-4306-8. ↑ Conrad Schirokauer; Miranda Brown (6 January 2012). A Brief History of Chinese Civilization. Cengage Learning. pp. 100–. ISBN 0-495-91323-5. ↑ Conrad Schirokauer; Miranda Brown; David Lurie; Suzanne Gay (1 January 2012). A Brief History of Chinese and Japanese Civilizations. Cengage Learning. pp. 100–. ISBN 0-495-91322-7. ↑ Patricia Buckley Ebrey. East Asia: A Cultural, Social, and Political History, Volume II: From 1600. Cengage Learning. pp. 74–. ISBN 1-111-80814-7. ↑ Patricia Buckley Ebrey; Anne Walthall (1 January 2013). East Asia: A Cultural, Social, and Political History. Cengage Learning. pp. 75–. ISBN 1-133-60647-4. ↑ Patricia Buckley Ebrey; Anne Walthall (1 January 2013). Pre-Modern East Asia: A Cultural, Social, and Political History, Volume I: To 1800. Cengage Learning. pp. 75–. ISBN 1-133-60651-2. ↑ Nicola Di Cosmo (2009). Military Culture in Imperial China. Harvard University Press. pp. 168–169. ISBN 978-0-674-03109-8. ↑ FREDERIC WAKEMAN JR. (1985). The Great Enterprise: The Manchu Reconstruction of Imperial Order in Seventeenth-century China. University of California Press. pp. 1071–. ISBN 978-0-520-04804-1. ↑ Discursive Resources and Collapsing Polarities: The Religious Thought of Tang Dynasty Scholar-officials. ProQuest. 2009. pp. 41–. ISBN 978-1-109-11898-8. ↑ Justin Wintle (2002). China. Rough Guides. pp. 158–. ISBN 978-1-85828-764-5. ↑ Richard von Glahn (10 March 2016). An Economic History of China: From Antiquity to the Nineteenth Century. Cambridge University Press. pp. 179–. ISBN 978-1-107-03056-5. 1 2 Tackett (2006), p. 67. ↑ Patricia Rosof (January 1985). Family History. Psychology Press. pp. 158–. ISBN 978-0-86656-136-5. ↑ Ainslie Thomas Embree; Carol Gluck (1997). Asia in Western and World History: A Guide for Teaching. M.E. Sharpe. pp. 350–. ISBN 978-1-56324-265-6. ↑ Thomas H. C. Lee (January 2004). The New and the Multiple: Sung Senses of the Past. Chinese University Press. pp. 276, 451. ISBN 978-962-996-096-4. ↑ Patricia Buckley Ebrey (1986). Kinship Organization in Late Imperial China, 1000-1940. University of California Press. pp. 59, 94. ISBN 978-0-520-05416-5. ↑ Mark Edward Lewis (2 April 2012). China's Cosmopolitan Empire. Harvard University Press. p. 326. ISBN 978-0-674-05419-6. ↑ Rubie Sharon Watson (1991). Marriage and Inequality in Chinese Society. University of California Press. pp. 131–. ISBN 978-0-520-07124-7. ↑ Peter Bol (1 August 1994). "This Culture of Ours": Intellectual Transitions in T?ang and Sung China. Stanford University Press. pp. 366–. ISBN 978-0-8047-6575-6. ↑ Revue bibliographique de sinologie. Éditions de l'École des hautes études en sciences sociales. 1960. p. 88. ↑ Digest of Chinese Studies. American Association for Chinese Studies. 1986. p. 15. 1 2 Asia Major. Institute of History and Philology of the Academia Sinica. 1995. p. 57. ↑ Tackett (2006), p. 92. ↑ 杨氏同宗 (2011-12-04). "唐朝宰相杨国忠及贵妃杨玉环世系". 杨氏网首页. ↑ Tackett (2006), pp. 90, 92. ↑ Tackett (2006), p. 64, 86-93. ↑ Hugh R. Clark (2007), pp. 39–40. ↑ Hugh R. Clark (2007), p. 77. ↑ "姑臧李氏李益真的如史学界说的"负心汉"？-快乐驿站-微头条(wtoutiao.com)". Wtoutiao.com. 26 February 2016. ↑ 金釵漩渦: 一件宮廷之寶，一樁陳年舊案、一對陌生男女。在陰謀的漩渦中，愛情、親情何去何從；在宮廷的爭鬥中，孰對、孰錯，掙扎徘徊。. 右灰文化傳播有限公司. p. 307. GGKEY:407NEQY6T0A. ↑ 王讜 (6 December 2014). 唐語林. 朔雪寒. p. 66. GGKEY:U0TYUJB3NJ0. ↑ "Past Glory Shines in Ancient Village". China.org. Retrieved 20 June 2016. ↑ Wakeman, Frederick, Jr (1985). The Great Enterprise: The Manchu Reconstruction of Imperial Order in Seventeenth-century China. University of California Press. pp. 343–344. ISBN 978-0-520-04804-1. ↑ Edward L. Farmer; Romeyn Taylor; Ann Waltner (1994). Ming History: an Introductory Guide to Research (PDF). History Department, University of Minnesota. p. 57. ISBN 1-886108-02-1. ↑ Bin Yang (2009). "Military Campaigns against Yunnan: A Cross-Regional Analysis". Between Winds and Clouds: The Making of Yunnan (Second Century BCE to Twentieth Century CE). Columbia University Press. ISBN 9780231142540. ↑ Bin Yang (2009), Rule Based on Native Customs. ↑ Bin Yang (2009), Sinicization and Indigenization: The Emergence of the Yunnanese. ↑ Zolfagharifard, Ellie (14 May 2015). "Gold-filled tomb of Chinese 'superwoman' uncovered: Ming Dynasty epitaphs reveal the remarkable life of Lady Mei". The Daily Mail. ↑ Jarus, Owen (13 May 2013). "Gold Treasures Discovered in Ming Dynasty Tomb". Live Science. ↑ Slav, Irina (14 May 2015). "Ming Dynasty Tomb Tells A Remarkable Life's Story". New Historian. ↑ Mote, Frederick W.; Twitchett, Denis (1988). The Cambridge History of China: Volume 7, The Ming Dynasty, 1368-1644. Cambridge University Press. p. 130. ISBN 978-0-521-24332-2. ↑ Mote & Twitchett (1988), p. 246. ↑ Edward L. Dreyer (1982). Early Ming China: A Political History, 1355-1435. Stanford University Press. p. 111. ISBN 978-0-8047-1105-0. ↑ Pamela Kyle Crossley; Helen F. Siu; Donald S. Sutton (January 2006). Empire at the Margins: Culture, Ethnicity, and Frontier in Early Modern China. University of California Press. p. 162. ISBN 978-0-520-23015-6. ↑ Nicola Di Cosmo; Don J Wyatt (16 August 2005). Political Frontiers, Ethnic Boundaries and Human Geographies in Chinese History. Routledge. p. 278. ISBN 978-1-135-79095-0. ↑ James A. Anderson; John K. Whitmore (7 November 2014). China's Encounters on the South and Southwest: Reforging the Fiery Frontier Over Two Millennia. BRILL. p. 146. ISBN 978-90-04-28248-3. ↑ Michael Dillon (16 December 2013). China's Muslim Hui Community: Migration, Settlement and Sects. Routledge. p. 34. ISBN 978-1-136-80933-0. ↑ Mote & Twitchett (1988), pp. 133–134. ↑ Wilson, Thomas A. (August 1996). "The Ritual Formation of Confucian Orthodoxy and the Descendants of the Sage". The Journal of Asian Studies. Cambridge University Press, Association for Asian Studies. 55 (3): 571. doi:10.2307/2646446. JSTOR 2646446. ↑ Chang Woei Ong (2008). Men of Letters Within the Passes: Guanzhong Literati in Chinese History, 907-1911. Harvard University Asia Center. p. 132. ISBN 978-0-674-03170-8. ↑ Rudolf G. Wagner (1 February 2012). Craft of a Chinese Commentator, The: Wang Bi on the Laozi. SUNY Press. p. 359. ISBN 978-0-7914-9338-0. ↑ Daniel K. Gardner (2003). Zhu Xi's Reading of the Analects: Canon, Commentary, and the Classical Tradition. Columbia University Press. p. 7. ISBN 978-0-231-12864-3. ↑ Mingyuan Gu (25 November 2013). Cultural Foundations of Chinese Education. BRILL. p. 85. ISBN 978-90-04-26316-1. ↑ Tianyu Cao; Xueping Zhong; Liao Kebin; Ban Wang (24 October 2013). Culture and Social Transformations: Theoretical Framework and Chinese Context. BRILL. p. 123. ISBN 978-90-04-26051-1. ↑ Joachim Gentz (4 September 2013). Religious Diversity in Chinese Thought. Springer. p. 18. ISBN 978-1-137-31850-3. ↑ Shih-shan Henry Tsai (1 July 2011). Perpetual happiness: the Ming emperor Yongle. University of Washington Press. p. 96. ISBN 978-0-295-80022-6. ↑ Xinzhong Yao (11 May 2015). The Encyclopedia of Confucianism: 2-volume Set. Routledge. p. 29. ISBN 978-1-317-79349-6. ↑ Mark P. McNicholas (5 April 2016). Forgery and Impersonation in Imperial China: Popular Deceptions and the High Qing State. University of Washington Press. p. 128. ISBN 978-0-295-80623-5. ↑ Forgery and Impersonation in Late Imperial China: Popular Appropriations of Official Authority, 1700--1820. ProQuest. 2007. p. 199. ISBN 978-0-549-52893-7. ↑ Xinzhong Yao (2003). RoutledgeCurzon Encyclopedia of Confucianism. RoutledgeCurzon. p. 29. ISBN 978-0-415-30652-2. ↑ Wakeman (1985), p. 858. ↑ Qin ding da Qing hui dian (Jiaqing chao)0. 1818. p. 1084. ↑ 不詳 (21 August 2015). 新清史. 朔雪寒. p. 138. GGKEY:ZFQWEX019E4. ↑ 王士禎 (3 September 2014). 池北偶談. 朔雪寒. p. 182. GGKEY:ESB6TEXXDCT. ↑ 徐錫麟; 錢泳 (10 September 2014). 熙朝新語. 朔雪寒. p. 39. GGKEY:J62ZFNAA1NF. ↑ Thomas A. Wilson (2002). On Sacred Grounds: Culture, Society, Politics, and the Formation of the Cult of Confucius. Harvard University Asia Center. pp. 69, 315. ISBN 978-0-674-00961-5. ↑ Thomas Jansen; Thoralf Klein; Christian Meyer (21 March 2014). Globalization and the Making of Religious Modernity in China: Transnational Religions, Local Agents, and the Study of Religion, 1800-Present. BRILL. p. 188. ISBN 978-90-04-27151-7. ↑ Wilson (August 1996), p. 575. ↑ H.S. Brunnert; V.V. Hagelstrom (15 April 2013). Present Day Political Organization of China. Routledge. p. 494. ISBN 978-1-135-79795-9. ↑ Thomas H. C. Lee (January 2004). The New and the Multiple: Sung Senses of the Past. Chinese University Press. p. 337. ISBN 978-962-996-096-4. ↑ Keiji Furuya; Chʻun-ming Chang; Chunming Zhang (1981). Chiang Kai-shek, his life and times (Abridged English ed.). St. John's University. p. 3. ISBN 0-87075-025-9. ↑ Anne Walthall (2008). Servants of the Dynasty: Palace Women in World History. University of California Press. pp. 148–. ISBN 978-0-520-25444-2. Frederic Wakeman (1 January 1977). Fall of Imperial China. Simon and Schuster. pp. 79–. ISBN 978-0-02-933680-9. Kenneth M. Swope (23 January 2014). The Military Collapse of China's Ming Dynasty, 1618-44. Routledge. pp. 13–. ISBN 978-1-134-46209-4. Frederic E. Wakeman (1985). The Great Enterprise: The Manchu Reconstruction of Imperial Order in Seventeenth-century China. University of California Press. pp. 61–. ISBN 978-0-520-04804-1. Mark C. Elliott (2001). The Manchu Way: The Eight Banners and Ethnic Identity in Late Imperial China. Stanford University Press. pp. 76–. ISBN 978-0-8047-4684-7. ↑ Chuan-Chao Wang; Shi Yan; Can Yao; Xiu-Yuan Huang; Xue Ao; Zhanfeng Wang; Sheng Han; Li Jin; Hui Li (April 2013). "Ancient DNA of Emperor CAO Cao's granduncle matches those of his present descendants: a commentary on present Y chromosomes reveal the ancestry of Emperor CAO Cao of 1800 years ago". Journal of Human Genetics. 58 (4). doi:10.1038/jhg.2013.5.